Yeah, you read that right. Don’t take TriMet to your 4th of July event. Or rather “Take TriMet to your 4th of July event if you can, just don’t expect to be able to take it to the events TriMet listed on their website” But that was too long to use as a title for this post. 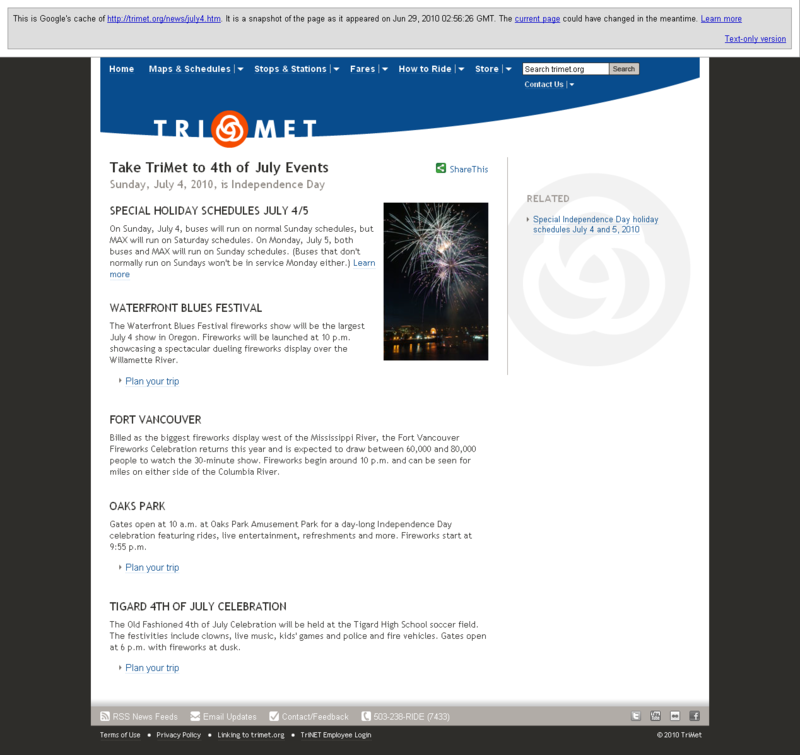 TriMet’s promoted 4th of July events: Edit – evening hours of 07-01-10: Hey cool, they listened to me! The old page listed the following events I have here in my post. The new page took the lack of bus service into account, and removed two of the promoted events due to no adequate service. WATERFRONT BLUES FESTIVAL – The Waterfront Blues Festival fireworks show will be the largest July 4 show in Oregon. Fireworks will be launched at 10 p.m. showcasing a spectacular dueling fireworks display over the Willamette River. 52, 62, 71, 77, 78, 88 – these stop running soon after 10pm, so even if one of these could get you there, it couldn’t get you back. FORT VANCOUVER – Billed as the biggest fireworks display west of the Mississippi River, the Fort Vancouver Fireworks Celebration returns this year and is expected to draw between 60,000 and 80,000 people to watch the 30-minute show. Fireworks begin around 10 p.m. and can be seen for miles on either side of the Columbia River. Well, you’ll need C-Tran for this if you actually want to go to Vancouver. But the same timing restrictions apply if you need any of the above TriMet buses to get there since these fireworks also start at 10. OAKS PARK – Gates open at 10 a.m. at Oaks Park Amusement Park for a day-long Independence Day celebration featuring rides, live entertainment, refreshments and more. Fireworks start at 9:55 p.m. Okay, take TriMet to this one if you go during the day… but you’re out of luck if you want to do the fireworks show as the 70 (which is about half a mile away) stops running at around 7pm. I suppose you could walk across the Sellwood Bridge and catch the 35, but that’s kind of far, too. TIGARD 4TH OF JULY CELEBRATION – The Old Fashioned 4th of July Celebration will be held at the Tigard High School soccer field. The festivities include clowns, live music, kids’ games and police and fire vehicles. Gates open at 6 p.m. with fireworks at dusk. The only bus that runs near here is the 76, and the last one that runs through there towards Beaverton Transit Center on a Sunday schedule goes by at about 6:55pm. So you’ll have to leave soon after you get there and forget about the fireworks entirely. 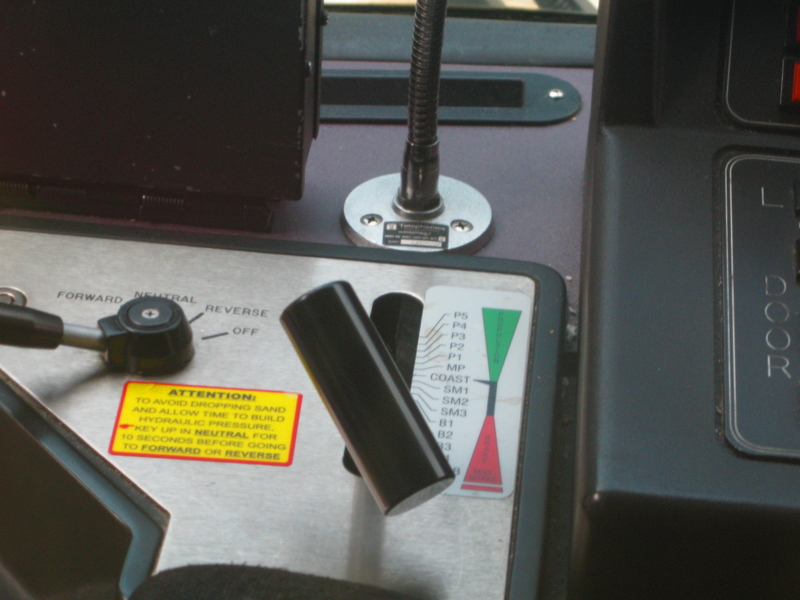 It didn’t feel right making a post without photos, but I don’t have any pictures of fireworks from a train cab. 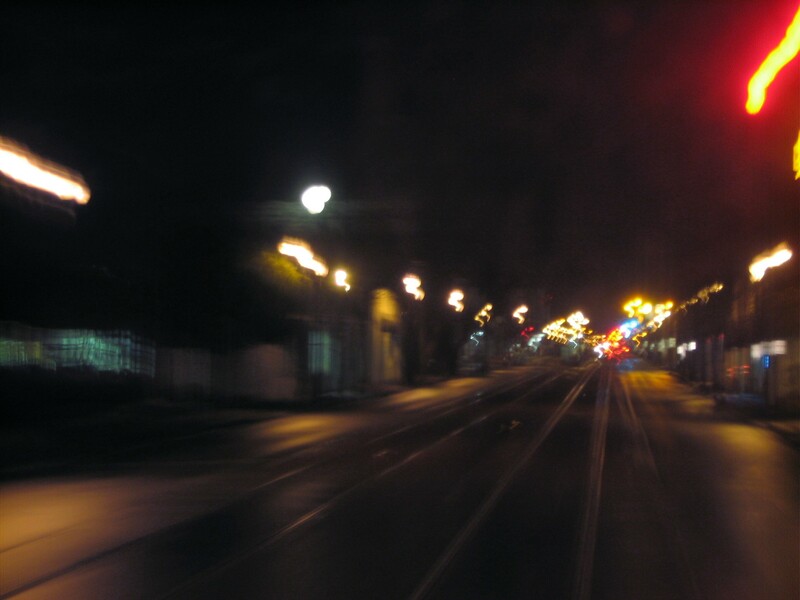 So, here’s Washington Street in Hillsboro at night from a train cab with a long exposure. Not fireworks, but it’s dark and colorful at least. This isn’t the first time TriMet has promoted community events by saying you should ride public transit to them before ensuring that those events actually would be serviced by TriMet – the same thing happened on Earth Day this year where they suggested taking the 24, 51, 47, and 59 buses to events during that weekend – and none of those buses run on weekends. Now in theory, I love the idea of getting people out and about and discovering cool things going on in their neighborhood by using public transit. 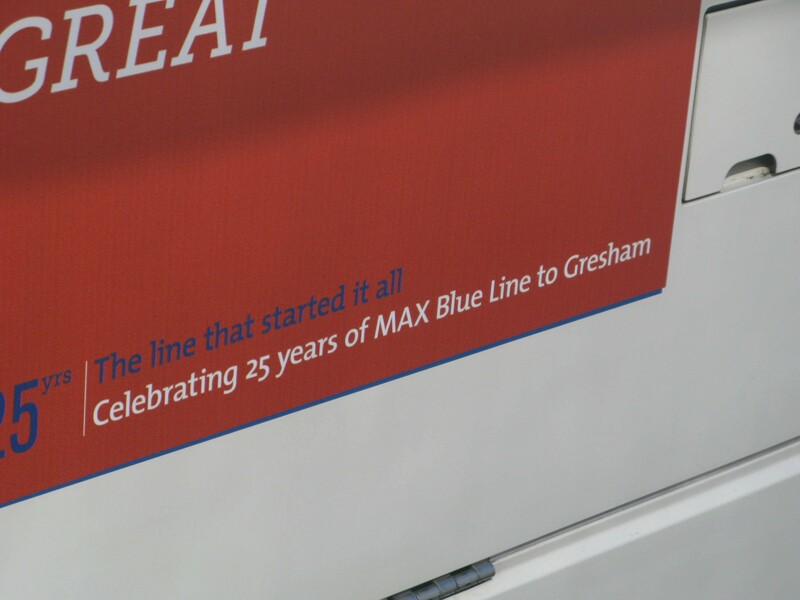 In fact, I think it would be great to see TriMet do more promotions about where you can get to via transit – the Transit to Trails was a great offering, and I think more things along that line (building on the old “See Where It Takes You” and “FIND” campaigns, maybe even promoting ridership on some of the buses that are close to the chopping block so that they are no longer on the chopping block!) should be a focus for TriMet. But this sort of thing just draws a glaring spotlight on the ongoing disconnect between TriMet-as-a-corporate-entity and the people who actually use (and operate) public transit. Shouldn’t whoever is behind these event promotions (marketing I guess?) be aware of the fact that with so many cuts to bus service, these events are not actually serviced by TriMet? I bet you the people whose lives were affected when they lost bus service by their homes or workplaces on weekends or outside of peak rush hour are precisely aware of what they no longer have access to. And I bet the operators who get uncomfortably full loads on their buses now that their route runs more infrequently notice too. On a related note, I know that Joseph Rose got upset about my door buttons redux post, feeling that I was personally attacking him. I was not (I had even acknowledged that he could have been given bad information from TriMet spokesperson Mary Fetsch) – I was attacking the same issue that I am attacking here. 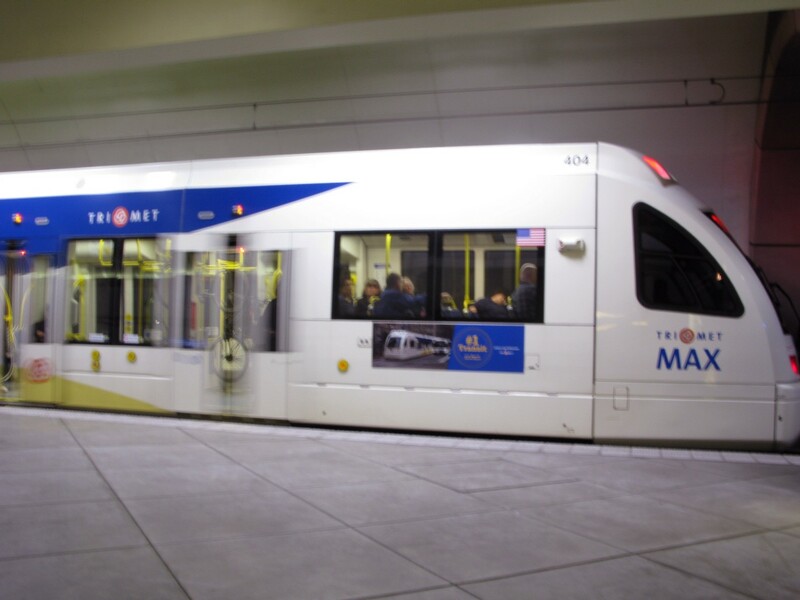 Too many times with TriMet, information comes from above that is inaccurate and shows a lack of understanding by TriMet administration of what actually goes on on the front line – in that case, a spokesperson telling a reporter incorrect information about train functionality. In this case, TriMet telling people to take transit that doesn’t exist to events. And that gets extremely frustrating for the people who are affected by the spread of bad information, whether it’s someone stranded because their bus doesn’t run as late as they thought it would, or an operator getting a customer complaint – not because of anything they did wrong, but because something didn’t work the way the customer was told it would. I don’t hate TriMet. 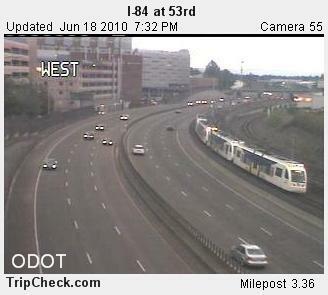 I mean, I spend a fair amount of my free time writing about TriMet light rail! I am not endorsed or supported by TriMet to write here, I do it because I like it and I like sharing what I know with people who are interested. I’d prefer to just be blogging about train stuff, but I just find it so disappointing that this agency has been dismantling bus service as much as they have. Which is made even worse by TriMet trying to promote events that you can’t reach by buses anymore since those bus runs have been discontinued! I wish you could take TriMet to those events. Or your job. 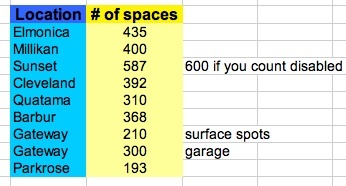 Or your place of worship, or your grocery store, or wherever you want/need to go. I really wish you could.